As if it weren’t enough to have accomplished what they have, David and his partner Jane, a dancer/choreographer, hold it as a tenet of the Digger brand of radical politics that one might move their ideals forward by engaging in agit prop theater. 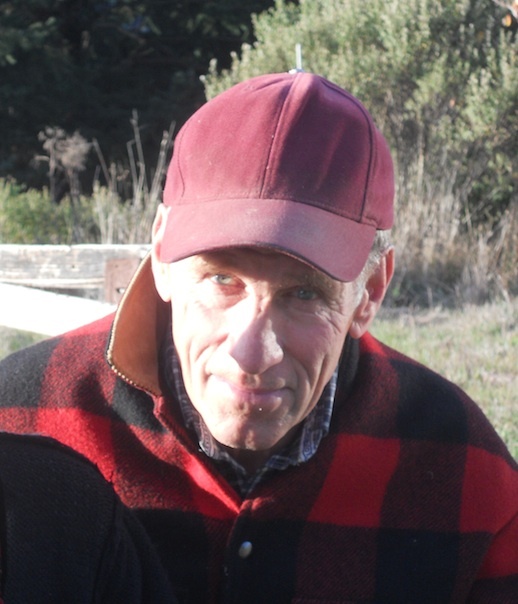 (Simpson and Lapiner met as members of the San Francisco Mime Troupe in l966.) With their company, Human Nature, they produced and toured, first. their mega-production, Queen Salmon, in which ranchers, rangers, wolves and deer all have their say with regards to the holy marriage of the salmon…and then The Wolf at the Door, a parlor drama which this member of their audience feels was their finest and funniest presentation of issues around the reintroduction of wolves into Yellowstone…to several editions of comic plays over the past fifteen years dealing with Climate Change, most recently Tripping at the Tipping Point. David and Jane have always been at the leading edge of an issue. Decamping last November 24th from Warsaw’s National Stadium where the 19th annual UN climate summit (COP 19) was in its last throes, my partner, Jane Lapiner, and I, were both struck by a particular sense of emptiness that was somehow deeply familiar but for the moment unattributable. The conference was ending with very limited accomplishment at best—as much as could be achieved considering the lack of commitment to strong steps on the parts of the wealthier nations. Given the stolid push and shove of contemporary politics, such inaction would have seemed closer to reasonable (many high human endeavors no matter how well-intended end with a whimper)had the barely hidden subtext of this event been other than the imminent demise of civilization. The stakes were, dare we say, stratospheric. High enough so that it might automatically be assumed that any aggregate of humans with a claim to leadership of the species (195 governments were represented at Warsaw) would get right down to dealing with the issue. The fact that they hadn’t was rendered more egregious, if not outright shameful, by Typhoon Haiyan that struck the Philippines just three days before the COP opened. This great tropical cyclone had winds of 190 – 195 mph at landfall, making it the strongest storm of its kind in recorded world history. With gusts up to an unprecedented 235 mph, the typhoon raked through helpless, low-lying coastal communities killing thousands and rendering many, many more suddenly homeless. Despite this terrifying prelude, the only thing resembling decisive action that came out of Warsaw occurred three days before the event closed. That’s when over 800 civil society representatives (climate activists, representatives of environmental, clean energy and social justice organizations or of other NGO’s) held a press conference and then walked out en masse to protest the prevailing state of inaction and the expanded influence at the event of large commercial forces. It might be more accurate to say that they ‘rode’ out given that it was a three-story escalator ride from the location of the rally to the level of the actual exit from the stadium. It’s challenging to try to maintain a demeanor of pained righteousness when you’re gliding in stately fashion down toward the exit like shoppers on sale day at the Mall who hadn’t found a deal. 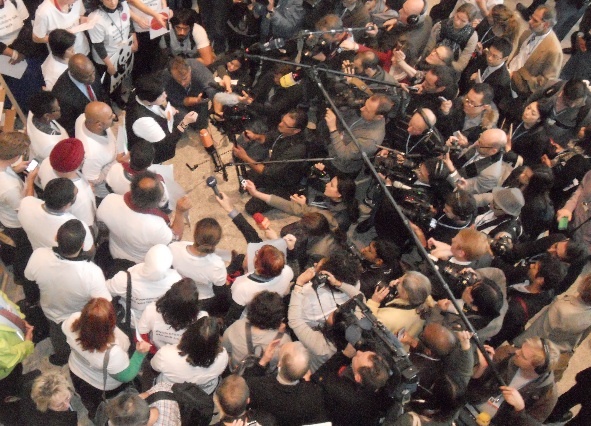 Everything about this conference came out seeming tame, even the protests. To be fair, there had been a relatively important effort at Warsaw, which met with some small success, to add a third category—Loss and Damage due to climate events—to the two previously established goals of climate financing –(1.) Mitigation meaning reduction of carbon emissions and (2). Adaptation to looming changes already too late to avoid. There was, though, no new budget commitment and indeed nothing resembling effective financing even for the original two categories. Countries with wealth were still keeping a tight hold on their purse strings through thick and thin—as if there might still be options for dealing with climate change that won’t require complete international commitment and open-hearted cooperation. The irony related to the level of influence being wielded by companies with large stakes in the burning of fossil fuels was enervating. 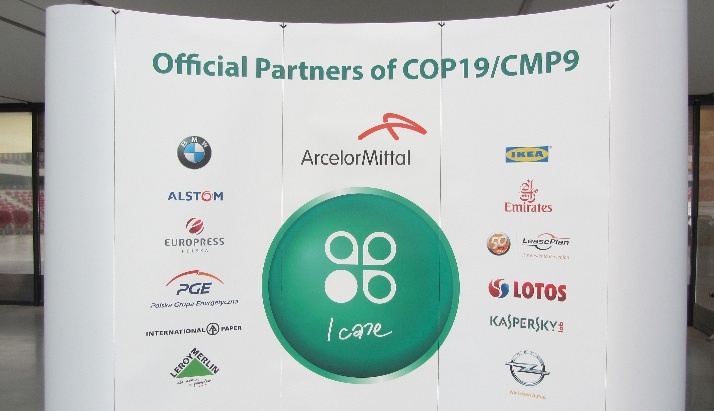 As corporate sponsors of COP 19—the first UN climate conference where such overt sponsorship had been allowed–their brands were visible all over. The ubiquitous presence marked by their logos, like a scent dogs leave, was disorienting for many climate activists. For them, these corporate entities were more often associated with the causes of climate change rather than the solutions. There was no avoiding the reality that the UN climate directorate (UNFCCC) was allowing opportunities for corporate green washing. The enemy had crept more deeply into the House of Climate Change. The dagger of irony took a deeper twist when another influence that had loomed large in previous COPs went altogether missing in Warsaw. 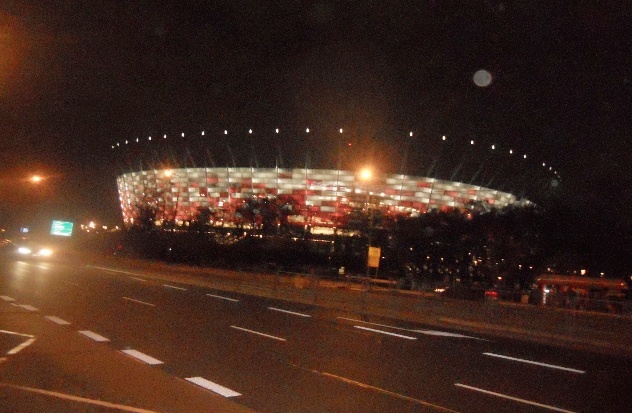 Press conference at National Stadium, Warsaw just before 800 walked out. Protesters in white to the left, press to the right. November 21, 2013. North American indigenous peoples who had provided a strong, visible presence at earlier climate summits had come to a quiet collective decision. Because of the ineffectiveness of earlier COPs to reduce emissions or to commit significant assistance to the most endangered populations, and in light of the strengthened corporate role in the process, native North Americans would not attend. Somehow the expansion of the slickly designed corporate presence combined with the absence of the overt, nature-based spirituality and down-home simplicity of Native Americans spelled out something painful about COP 19 and the whole UN climate process. Who was going to be there amid all the sterile, white temporary partitions (the meeting rooms) and tailored black suits to remind us of simple truths that ‘educated’ elites find so corny and discomforting, like “We’re killing our mother”? The UN effort seemed to be moving in the direction of larger engineered and financialized solutions (carbon storage, bioengineering, carbon-trading) and away from the wisdom gained from millennia living in place–toward enabling further indulgence and away from urgently needed forbearance. It was as if a trade-off had quietly taken place that gave even more control to the entities that stood to benefit from the basic problem by scrupulously not solving it. So we fled the National Stadium, not exactly resigned to the outcome but still despondent in face of what was inevitably coming. Anthropogenic climate change remained once more virtually unchallenged at the international level. Other Haiyans waited in the wings, and we had to face the specter of a climate increasingly unleashed from long-evolved controls. Though full commitments to solid goals are supposed to be made by the Parties (countries) by COP 21 in 2015, too many COPs have ended without real progress toward reducing admissions to allow much hope. The escalator walk out. 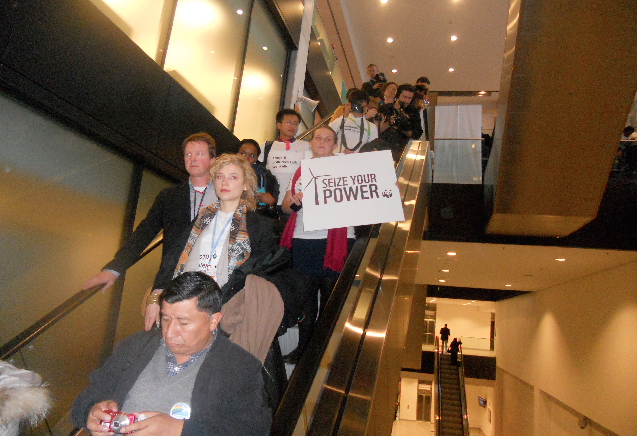 800 leave the UN conference in protest to inaction. November 21st, 2013. It was this sense of powerlessness in the face of great impending harm that reminded me suddenly of the earlier experience of emptiness and lack of hope that I couldn’t recall at first–New York City, Union Square, March 19th, 2003. Jane and I were in the city with a show, What’s Funny About Climate Change, our first climate change comedy. We had been touring around the country with the show along with our daughter, Joyful for 6 weeks and had witnessed the slow building of media and government’s engineered efforts to create the will to go to war in Iraq—or better, their steady wearing down of resistance to it. We had encountered several organized protests against the war along the way and jumped into a few. They seemed relatively interchangeable. You could get your standardized protest—same chants and songs, same big puppets, same slogans on banners, same hard-eyed police standing by waiting for an opportunity—in locations all over the US, a kind of MacDonaldized protest movement. One we took part in was outside Colorado Springs on the day that 6 to 7 million protested world wide and who George Bush later dismissed as a ‘focus group’. The event in Union Square turned out not to be a protest at all. Earlier that evening, George Bush had made his inept declaration of war with all its obviously unproven casus belli. It was just a matter of days or even hours before Shock and Awe was to be loosed. In light of this recognition and the agonizing corroboration of our powerlessness, the event in Union Square had turned outright funereal. People stood in subdued clusters, gathered around single or small bands of folk musicians whose songs—even or especially those of courage and of prevailing over evil—seemed to fall into an air emptied of meaning. The organizers had passed out candles in little cups to everyone. The thousands of little flickering lights, rather than providing a gentle and uplift of spirit, seemed mournful, a tribute to those who were soon to die. Many of those gathered in the growing darkness were openly weeping. Our protest was indeed over. A multitude of innocent lives were to be sacrificed. The world was to be further damaged. Great material wealth, desperately needed to face the combined planet-wide challenge of climate change and inequitable distribution, was to be squandered in the nonsensical delivery of pain. We knew all this as well as we knew our own names and we were helpless to alter the course of events. A war-torn decade later as we pushed ahead into the chill evening in Warsaw with this memory now in mind, we knew that the climate’s shock and awe was upon us. It was just a matter of time and the luck of the draw where and when the next bomb would drop—the next shoe or the next many shoes. The great gathered powers had taken mincing little steps forward—far beneath the rate of growth of emissions–meager effort against a swelling tide of inconceivable magnitude. As who knows what tipping point after what tipping point were being reached, Humankind, organized into corporate-driven nation states, quibbled over picayune details and waved flags in order to dodge responsibility. As if we still had a choice—as if we could continue to pursue wealth, profit or an indecent level of personal comfort without rendering the future unlivable.